In our post earlier this year, “A fixed price taxi booking system this ain’t….,” we examined how TaxiMap calculates prices based on the distance of any journey, and the advantages this provides over a fixed price model. In this post we aim to show why fixed pricing is an out-dated concept, especially when it comes to online taxi bookings and price calculation…. But not on the Internet! The Internet doesn’t lend itself to this model. 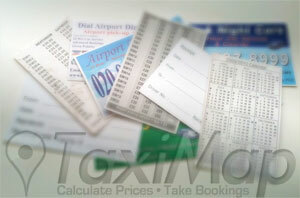 On the Internet fixed price taxi journeys require either a complex table or accurate location searching/selection. So, as a means of attracting new business, it’s a fail from the get go. These days people expect web sites they visit to be both interactive and intuitive, and understanding that TaxiMap provides both these qualities, why try to force a fixed price model? TaxiMap’s ZONES feature lets taxi firms adjust pricing for different journey types such as airport transfers by selecting a dedicated price for each airport, thus providing a much more fair price to the customer who will be quoted a precise price for their journey. So, it’s time to leave fixed price taxi journeys behind – at least on your website – and let TaxiMap do what it was designed to do…. TaxiMap does what it does really well. What it doesn’t do, it doesn’t do. NextAdapting to online: Responsiveness is key!